Wednesday April 20th 1904 I baked bread and did the regular work. We have Reuben Shoals working now by the day. I went down to Kosers to get Fannie by telephone but could not. I am making tatting for her. Still windy. 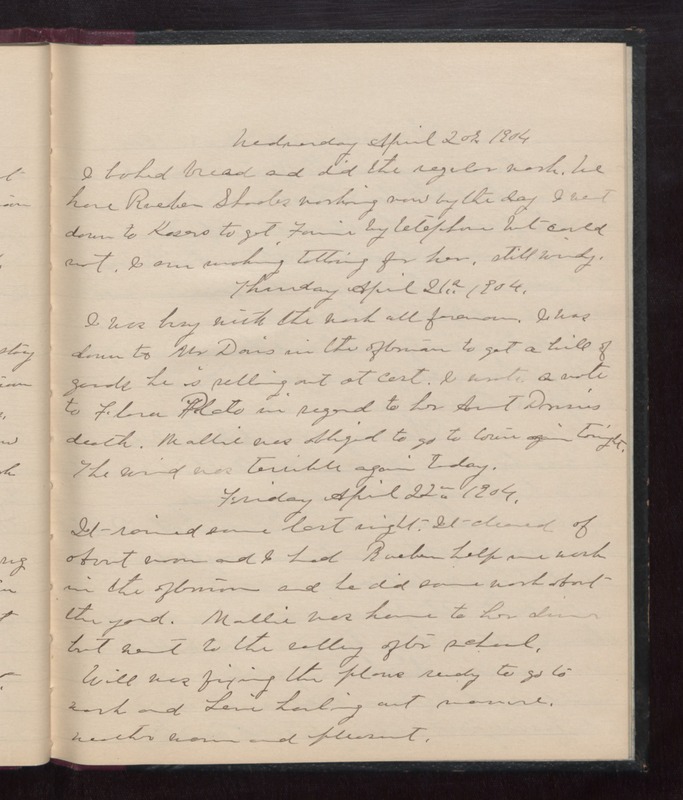 Thursday April 21st 1904 I was busy with the work all forenoon. I was down to Mr Davis in the afternoon to get a bill of goods he is selling out at cost. I wrote a note to Flora Plato in regard to her Aunt [Dresies?] death. Mollie was obliged to go to town again tonight. The wind was terrible again today. Friday April 22nd 1904 It rained some last night. It cleared of about noon and I had Rueben help me wash in the afternoon and he did some work about the yard. Mollie was home to her dinner but went to the valley after school. Will was fixing the plows ready to go to work and Levi hauling out manure. weather warm and pleasant.